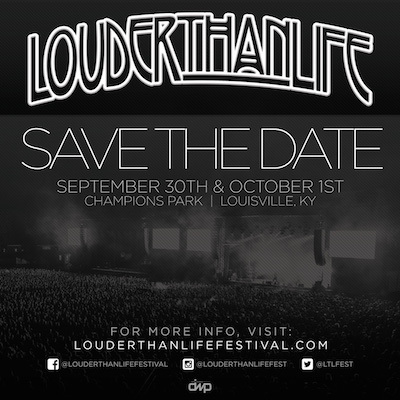 Save the date and ready your appetite: after three successful years, LOUDER THAN LIFE returns to Champions Park in Louisville, KY on Saturday, September 30 and Sunday, October 1, 2017 for its 4th year of rock 'n' roll, Gourmet Man Food, local craft beer, onsite experiences, and the mind-blowing Bourbon World. Look for more details to be announced in May. Produced by Danny Wimmer Presents, America's premier production company for rock music festivals, Louisville's LOUDER THAN LIFE features a selection of award-winning bourbons, whiskey, spirits, craft beer, and Gourmet Man Food curated personally by festival creator Danny Wimmer, along with a powerful music lineup of rock legends and breaking talent. The festival celebrates the bourbon culture and culinary heritage of this unique American city. In 2016, LOUDER THAN LIFE topped 50,000 in attendance for the second year in a row, with Slipknot and Avenged Sevenfold headlining together for the first time ever.